School may be out for the summer but the bell is ringing in my kitchen! 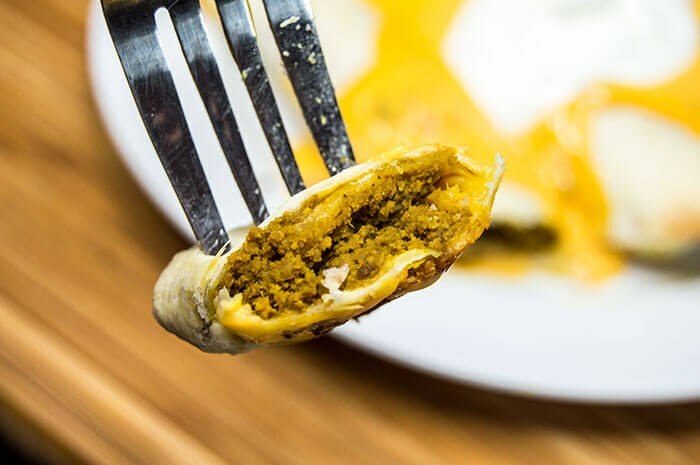 This recipe comes straight from the halls of my own alma mater, Carroll High School in Dayton, Ohio, where I fondly recall racing my fellow students to the cafeteria to be the first in line on crispito day. Back then, we didn't mind wolfing down the mystery-meat filled tortillas that also spewed some kind of orange-ish, watery liquid. We LOVED them. Everyone looked forward to crispito day at good ol' CHS. 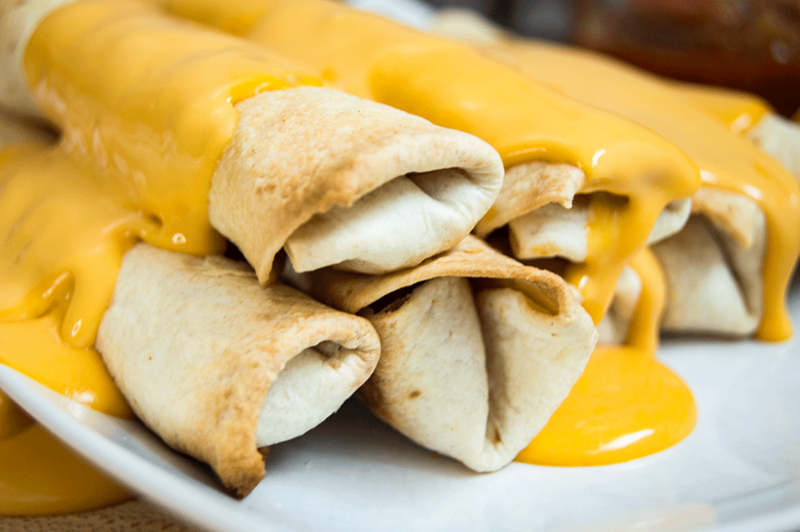 Now, nearly ten years out of high school and four years out of college, crispitos have come back to haunt me - in a good way! This week's challenge was cafeteria food, no doubt to torture any students just released into the summer. Despite the fact I had a total "my dog ate my SD card" (true story) and had to make these crispitos two nights in a row (no complaints here), these crispitos brought back of flood of high school memories. 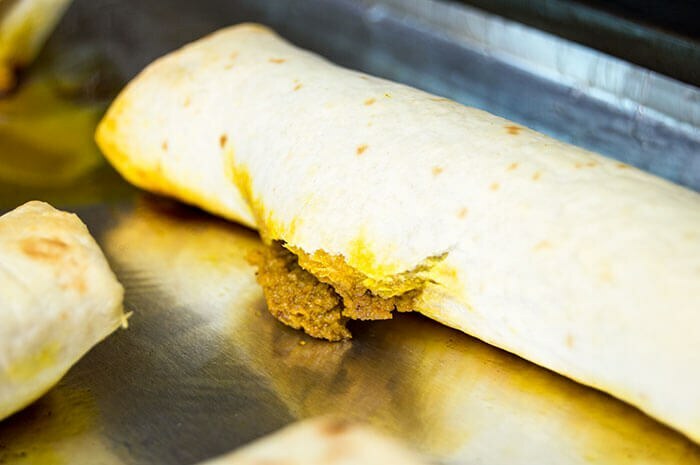 The most important part to crispitos is getting the right flavor and texture to the "mystery meat" - which in my recipe is just regular ground beef. 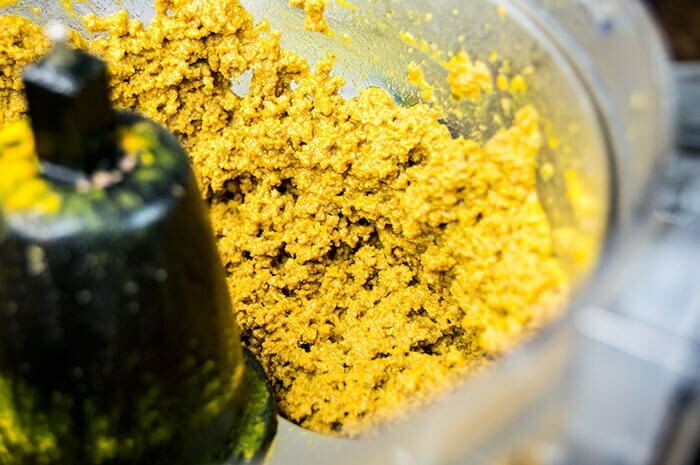 The real trick to getting the right consistency is to use a food processor or blender to get the meat down to a paste-like texture. The meat should be a yellow-orange-ish color if you want to be truly authentic to the cafeteria cuisine. But definitely feel free to adjust the seasonings to your now refined, adult palate. 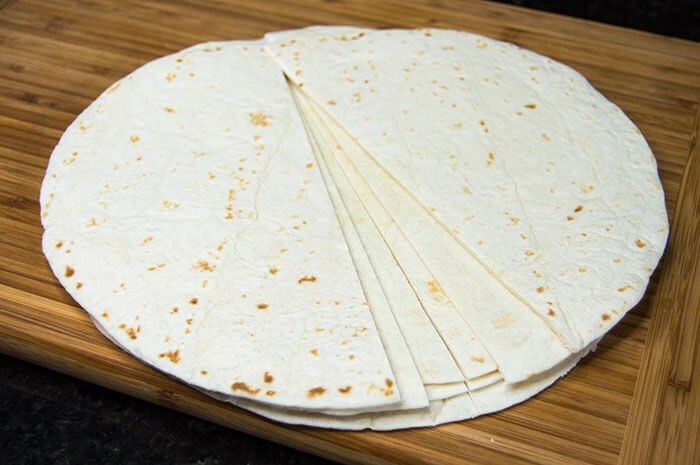 The next trick to achieving the perfect crispito is to only use half of each tortilla. If you use the whole thing, the tortilla is too thick to properly crisp up, so you'll be left with, essentially, a sad soft-shell burrito. And plus, by using only half of a tortilla, you get twice as many crispitos. Crispitos are rolled pretty tightly, so I shaped my meat into the right form before I folded the edges of the tortilla over the filling and wrapped it up. 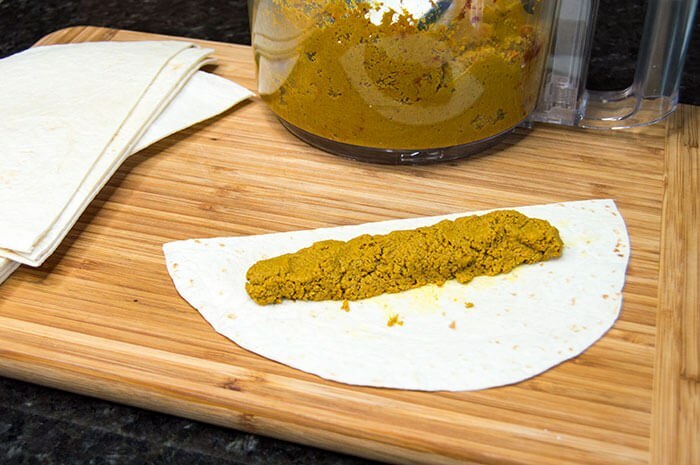 Place the filled tortillas seam side down on a greased baking sheet. Use an veggie oil based cooking spray - the same you'd use to grease the baking sheet - to quickly spritz the tops of each tortilla. That's how they get crispy! Bake the crispitos in the oven for about fifteen minutes - the best way to know they are done is when the first one "pops." That's how you know you've rolled them tight enough and they've cooked all the way through. 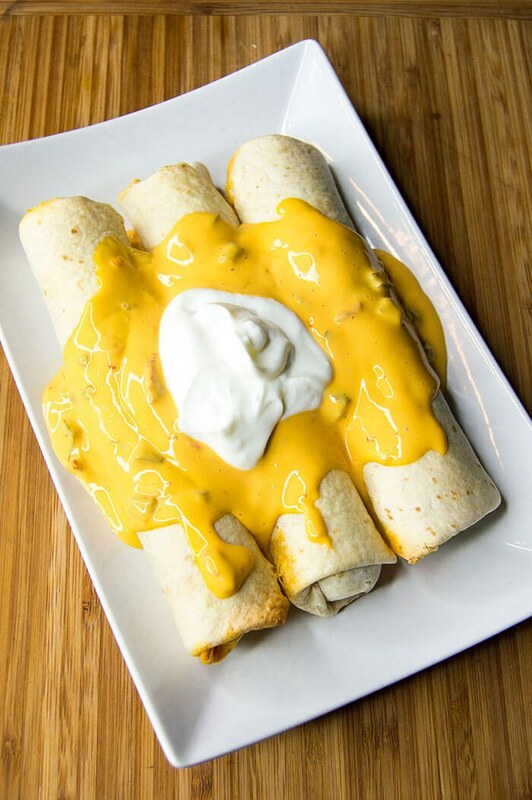 Back in my high school days, we smothered our crispitos in cheese sauce and sour cream...it's a wonder we didn't all weigh a million pounds, especially after some football players would wolf down twenty or more in one sitting. I'm not sure if CHS still has crispito days - I'd hope for the sake of tradition they do! Preheat the oven to 400 F. Cook and crumble the ground beef. Rinse in a strainer then transfer to a food processor. Add the paprika, turmeric, cumin, water and salsa. 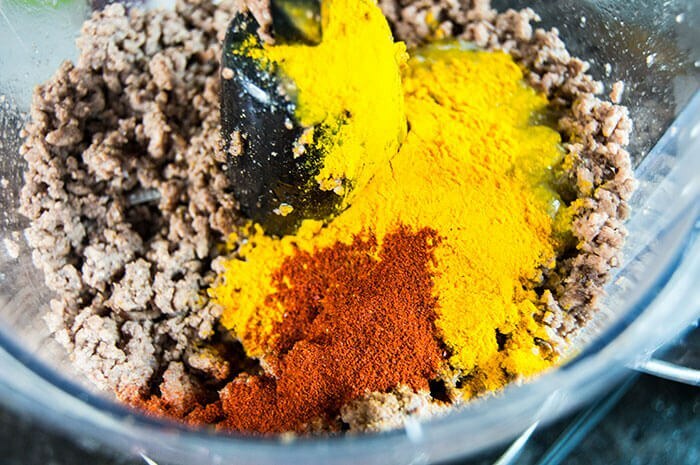 Use the food processor to blend up the meat until paste-like in consistency. Cut the tortillas in half. Measure out approximately 1/4 cup of the filling and arrange it in a log-like shape about a half inch in from the cut side of the tortilla. Fold over each end and tightly wrap the tortilla around the filling. Spray a baking sheet with cooking spray. Place the filled tortillas, seam side down on the greased baking sheet. 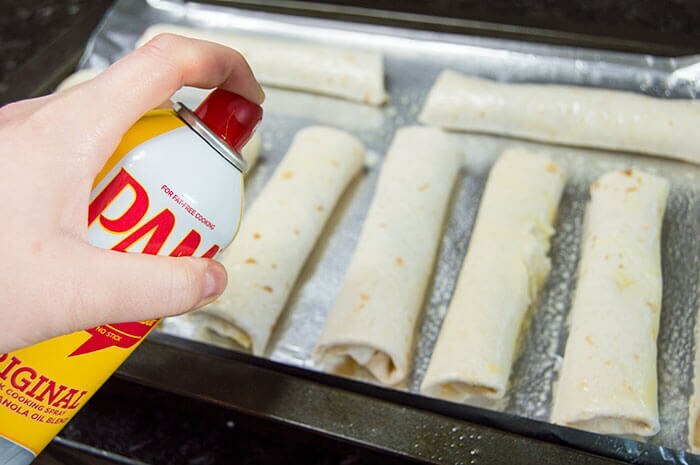 Spray the tops of each filled tortilla with a mist of cooking spray. Pop the baking sheet into the oven and cook for 12-15 minutes, until they are just starting to get crispy but haven't started to brown. 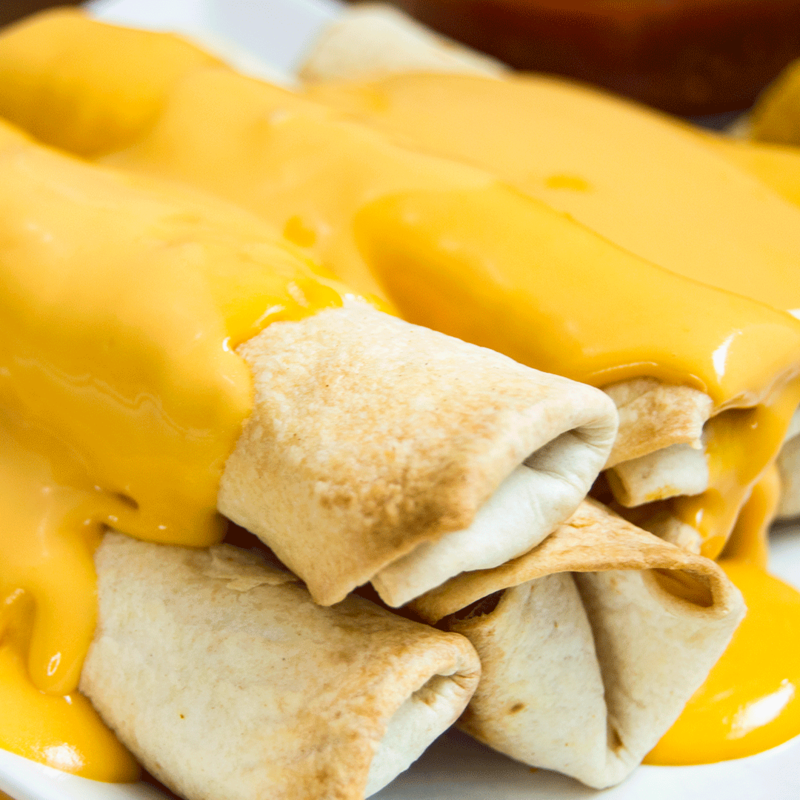 Serve topped with a generous helping of nacho cheese and sour cream. Enjoy! GO PATRIOTS!